The 7 panel drug test checks the urine for 7 different types of drugs. What is tested in the 7 panel drug test? The 7 panel drug test checks the urine for amphetamines (e.g. Adderall, Methamphetamine, MDMA), barbituates, benzodiazepines (e.g. Valium, Xanax, Klonopin), cocaine metabolites, marijuana metabolites, opiates (e.g. Codeine, Morphine) and phencyclidine. Why is the 7 panel drug test important? The 7 panel drug test checks the body for drug exposure for general screening, pre-employment or work or school compliance. This 7 Panel Drug Test is a urine test. The 7 panel drug test, also known as a seven point drug test, seven point drug test, and seven panel drug screen, checks for seven common drugs in the urine. There are two major reasons why people order a 7 panel urine drug screen. One reason is that they need it for compliance reasons for school, a rehabilitation program or work. Regarding work, in some cases, an employer will order this drug screen on behalf of a new employee. The other reason the people get the 7 drug urine test is to check the levels of specific drugs in their bodies. In comparison to the 10 panel drug test, the 7 panel urine test does not check for prior exposure to methadone, phencyclidine or propoxyphene. Like the 10 panel drug test, this 7 panel urine screen does not check for alcohol ingestion. Metabolites of recent alcohol use are measured at sensitive levels in the EtG urine test and qualitatively through the ethyl alcohol urine test. To get a seven panel drug test near you, order online and get your urine test at the Quest Diagnostics lab that you selected. 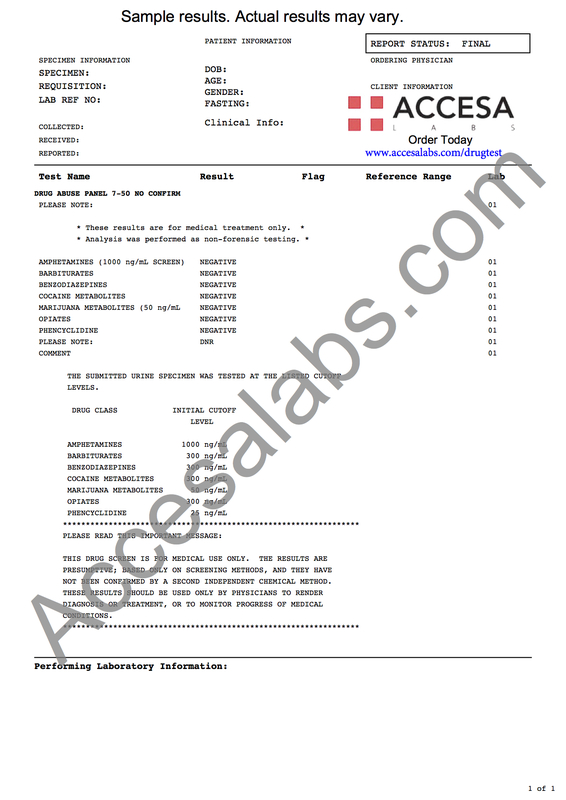 Once your seven drug screen lab results are ready, they will be available for download. As can be seen on the sample seven panel drug lab report above, the seven individual drug urine levels will be reported as negative if no drug is detected when compared against the cutoff levels provided by the lab. This 7 point drug screen is not a chain of custody test and does not run a confirmatory test if one of the seven drug screen results comes back positive. If you are specifically interested in the presence of marijuana, a more sensitive test for recent marijuana use is the marijuana metabolites test. 7 Panel Drug Test at Guaranteed Prices.